Mark your calendars for the Annual General Meeting of the Fallasburg Historical Society (FHS) on Monday, June 18th. The meeting will be held at the Lowell Area Chamber of Commerce at 7 p.m. The purpose of the Annual General Meeting is to identify and to present to the general membership, a slate of candidates for election to the FHS board. The one-room schoolhouse museum opens for the season on June 3rd from 2 p.m. to 4 p.m. It will be open every Sunday through September. Plan your visit with us this summer and fall. Fallasburg, MI – As you plot your museum tour this weekend, stop by in the Fallasburg pioneer village just three miles north of Lowell. Just cross the Covered Bridge into the 1837 village founded by John W. Fallas. You will have stepped back in time. 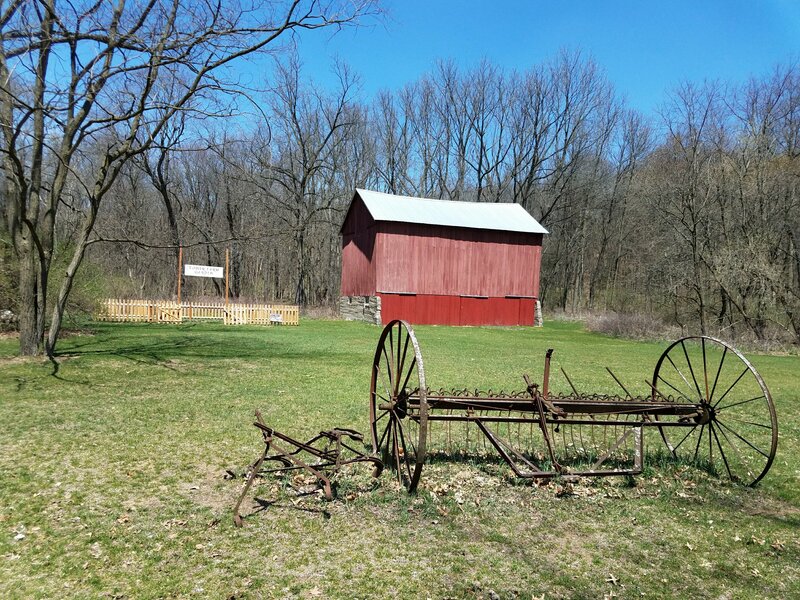 You will marvel at the historic treasures like the one-room schoolhouse, the Misner House, the John W. Fallas House and the Tower Farm & barn, all preserved under the auspices of the Fallasburg Historical Society (FHS). 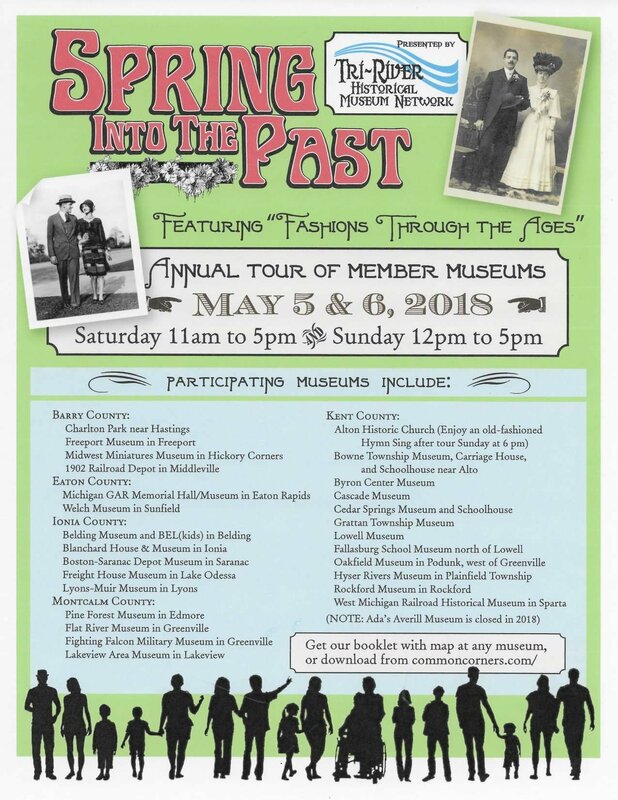 “Spring Into the Past” is a tour of the museums of the Tri-River Historical Museum Network in Barry, Eaton, Ionia, Kent and Montcalm counties. “We’re continuing last year’s theme of “Fashions through the Ages” with many new displays as our member museums or historical societies roll out their red carpet to show off the unique history of their communities during this annual event,” said Tri-River Museums Network spokesperson Judy Gager. Visit TriRiver on Facebook, too. Beach wear, bustles and bridal gowns – a variety of timeless “Fashions Through the Ages” will be visible in the museums of the Tri-River Historical Museum Network during the annual museum tour. The quaint museums are as versatile as the fashions, located in former vintage homes, meeting halls, stores and depots in small communities throughout the Tri-River Network. Participating museums in the Spring into the Past Tri-River Museums Network. “They all are eager to share the history of their community both past and present,” said Gager. Museum hours are usually also varied, but during this annual event all museums are open the same days and hours so visitors can tour several the same day: Saturday from 11 am to 5 pm and Sunday from noon to 5 pm. “Fallasburg always Partakes in this annual tour,” said FHS spokesperson Emma Palova. Get an informational booklet at any museum. Museums are free, but donations are certainly appreciated! It is with heavy heart that I write my spring message. Charter member of the West Central Michigan Historical Society, former President of the succeeding Fallasburg Historical Society, and lifetime champion of the cause of preservation, Edwin Roth passed away March 8Th at 98 years old. To say Ed lived life to the fullest would be a vast understatement. His spirit will of course live on, his legacy, one of many, Fallasburg Village today. Everyone who knew Ed Roth has a story. His easy-going, self-effacing manner made you comfortable when you were around him, his sense of humor ever-present. I believe we all marveled at his longevity in our individual quests to find the fountain of youth. Ed’s answer was simple, eat right, live clean, and another nugget he shared with me last Christmas with a large smile, “Don’t go to Doctors”! That was Ed. I wasn’t around when Ed Roth staked the National Historic Site Marker at the John Wesley Fallas house which was undergoing a major restoration in the 1990’s. I was around when Ed accepted the award from the Michigan Barn Preservation Network for “Barn of the Year,” 2014, recognizing the Fallasburg Historical Society’s work on the Tower Barn. These projects, amongst so many others, we’re the labor of Ed Roth’s love, and he maintained a strong and steady hand in all of them. Thank you, Edwin Roth! You are irreplaceable! The clipping is from the FHS scrapbook’ circa 1990. The historic district status was awarded in 1999. Still in the firm grasp of winter cold, but on a bright and sunny day, the Calvin College History Department’s “Public History” class visited Fallasburg on January 17TH. Professor Kate VanLiere’s students, as part of a month-long intensive study course stopped first at the Lowell Area Historical Museum to get a look at the inside workings of a small museum and a grand tour from Executive Director, Lisa Plank. Then it was on to Fallasburg for a walking tour with yours truly and their outside look at our National Historic District. The group of 30 briefly popped their heads in the door of the Schoolhouse, Misner House, and Fallas House. With FHS’ small museums in hibernation for the winter, and each property unheated, it was actually colder inside than out. Our brisk walk was appreciated and gave our visitors an overview of the entire Village from Fallas Barn to Covered Bridge. Calvin College students tour Fallasburg villlage. For the third consecutive year, the Calvin College History Department has provided a student intern for the Winter/Spring term to assist FHS with our digital cataloging of documents, photographs, and artifacts. Under the tutelage and mentorship of Lisa Plank at LAHM, this year’s intern, Grace Bolt, has focused on the treasures contained in the School. Most remarkable have been the handwritten Attendance Ledgers which chronicle Fallasburg School students, school year by school year, back to the early 1900’s, all completed by the teacher of the day. Grace has painstakingly recorded and photographed the logs. She could now tell you, if you went to Fallasburg School, when you were absent, and what ailed, lots of Chicken Pox, Mumps, and Measles. With a keen interest in Geography as well as History, tech-savvy Grace is working to create an online aerial view map of Fallasburg that highlights all its historic sites, buildings standing or not. Pictured above Mr. Ed Roth at Lowell Expo 2017 with daughter Jeanne Vandersloot, and FHS members Tracy Worthington and Al Rumbaugh. Fallasburg Historical Society, Table #129, at the Lowell Community Expo, Saturday, March 24, from 9AM – 3PM, Lowell High School. 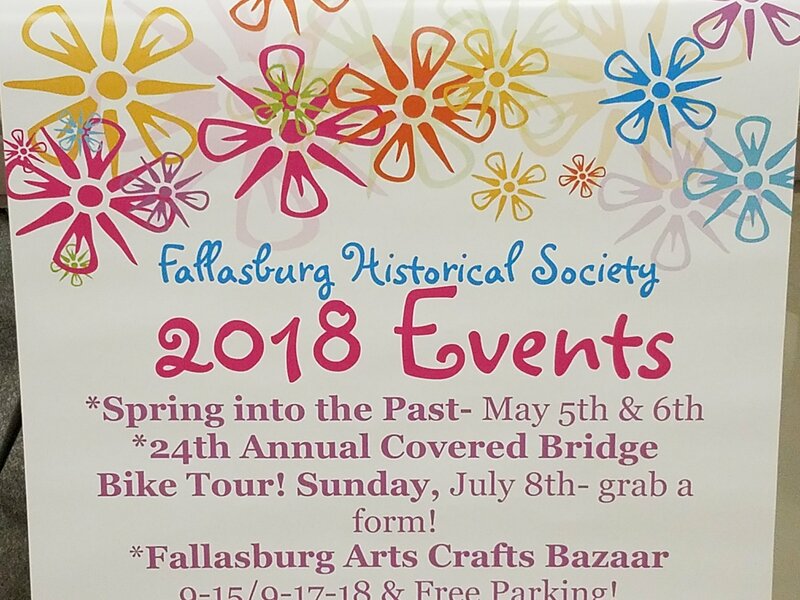 Fallasburg Village comes out of hibernation, Saturday, 11AM – 5PM & Sunday, 12PM – 5PM, May 5 & 6, the first weekend in May! We’ll participate in the Tri-Rivers Museum Network’s, “Spring into the Past” event. 41 small local museums team up and open up-free of charge! About the feature photo: Mr. Ed Roth with Randy Mouw, Barncats Contractor who fixed the Tower Barn, accepting Barn of the Year award for 2014 from the Michigan Barn Preservation Network. Wishing everyone a great new year from the Fallasburg Historical Society. (FHS). Visit the pioneer historic village in 2018 for fun and adventure. Check out our events. Join the FHS to help us preserve history for the future generations. For more info go to http://www.fallasburg.org.